At my office, we are lucky enough to get a CSA delivery of fruit and nuts every week. We get fresh, seasonal fruit to snack on while we're working, but sometimes we don't make it through all of the older fruit before the new delivery comes. So…rather than chuck out the older, slightly less than perfect fruit, I usually take it home. The next morning, I share something delicious with my coworkers made from the fruit. They always enjoy that. Last night I baked a gluten-free apple and pear crumble (the crumble part isn't mastered yet, so I'll blog that when I really nail it). But I still had some fruit left that was even more bruised. So I made an apple pear sauce! I made up this recipe on-the-spot, here you go! Enjoy! This recipe comes out slightly tangy and slightly creamy. It's delicious and sweet without any sugar or sweetener added at all! 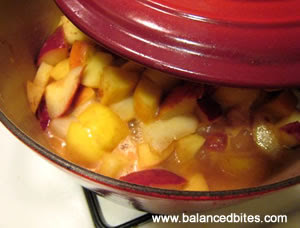 Toss fruit, lemon juice, lemon zest and butter in a large enameled cast iron pot. Simmer on medium until the fruit is soft (approx 15 mins), then mash it right in the pot with a potato masher. You can either leave it this chunky consistency, or do as I did and use a blender to make it smooth. Cook it down until it's as thick or as runny as you like it. Total cooking time was probably about 30 minutes or less. 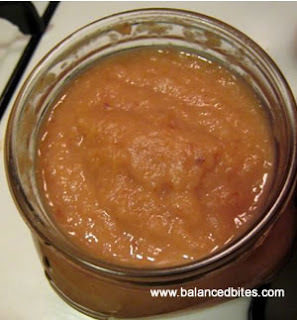 I was looking for a homemade applesauce the other day and this looks great! I can't wait to try it out! Thanks for sharing!